Pho­tog­ra­phy pod­cast #103 talks about a wet weather pho­tog­ra­phy umbrella con­trap­tion that I recently put together. Basi­cally it’s a GIANT golf umbrella and a sling. 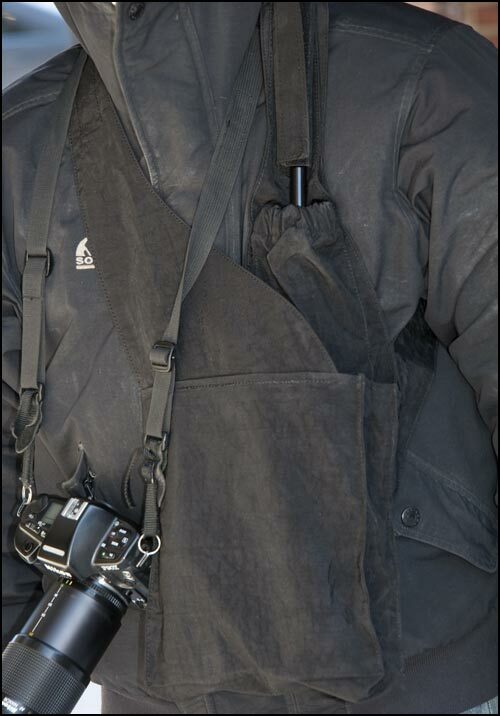 I’ve been shoot­ing a lot in the rain and snow lately and some­times you need to have both hands free. 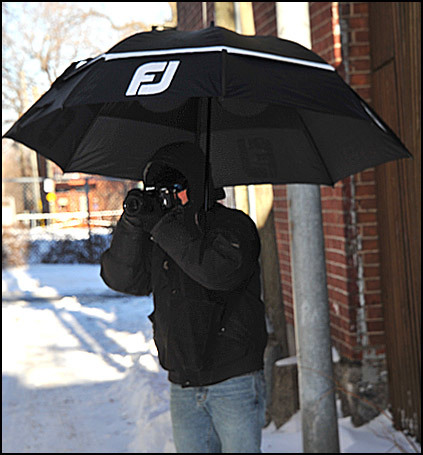 This umbrella con­trap­tion allows you to keep both hands on the cam­era and works well in heavy rain or snow so long as it’s not too windy. This giant 68″ dou­ble canopy Gust­buster golf umbrella in a sling gives you close to 30 inches of dry shoot­ing when it’s not too windy. A close-up of the sling I pur­chased from brellabag.com — It’s pricey at $30. but works well when the sling is loaded with heav­ier items like a long lens or bot­tle of water. Thanks to cartman75, Benny and Gale who posted blog com­ments about our last pod­cast. Thanks as always to every­one that sent com­ments by email about our last pod­cast. Although ALL com­ments are appre­ci­ated, com­ment­ing directly in this blog is pre­ferred. Thanks as well to all the new mem­bers of the bul­letin board. Most of the links to actual the prod­ucts are affil­i­ate links that help sup­port this site. Thanks in advance if you pur­chase through those links.